Villa “DIAMOND” is one of six boutique villas, elegantly decorated. 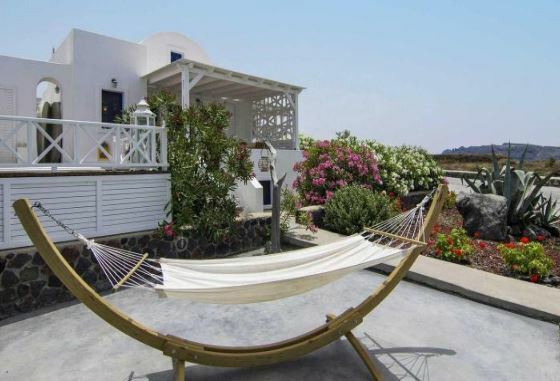 The villa is located in the north of Santorini Island in the traditional settlement of Oia (Ia) village. It is just 400 m. from the village, but so far enough away from “civilization” to be peaceful and the same time quiet. Ammoudi bay is just in walking distance, as well as Katharos beach. From Ammoudi bay you can swim at St.Nicolas Island and rent inflatable boat or arrange a sailing tour, get a trip to Volcano and Thirasia Island or just around Caldera. 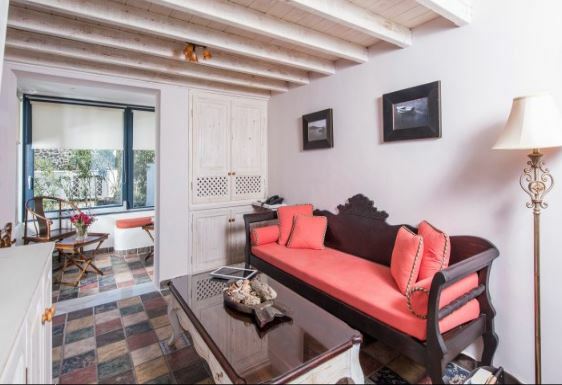 This elegant house comes highly recommended and features well-appointed accommodation. It was built to a high standards and is traditionally designed, throughout with much attention to detail. The use of traditional stone and some of the best materials have been included throughout the design and have been used in harmony with the environment! The expansive garden of the property filled with different kind of flowers and bushes have been specially designed to maintain the high standards. Outside there are a private yard and a balcony, overlooking the Aegean Sea and the most famous sunset, with a dining area for 10 persons, to enjoy alfresco dining. 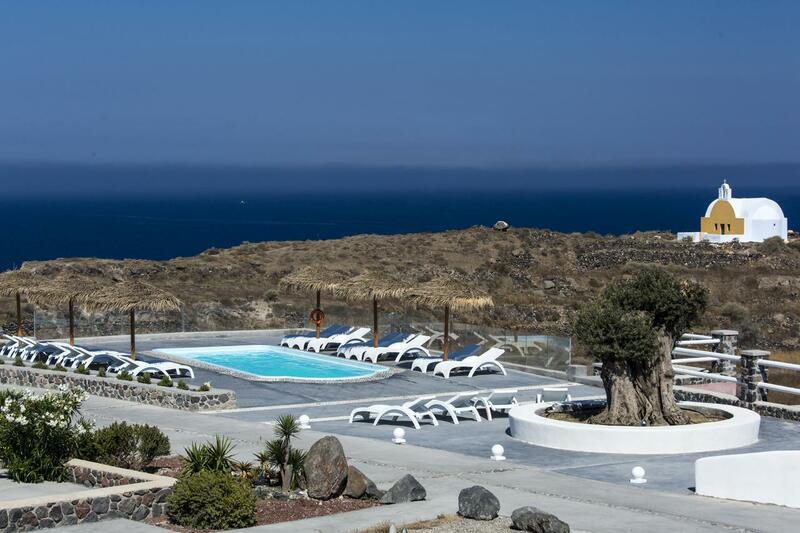 Also, there is a private outdoor heated hydro massage spa (for 5 persons) and two common use swimming pools, which combined with the perfect sea view, will keep you there the whole day. The luxury combined with the ultimate privacy offers an unforgettable stay and a unique experience. Inside there are 4 bedrooms (2 double king size bed and 1 bunk bed at lower level plus 1 king size bed at the upper level loft, which is separate from the others, with its own bath & living room). 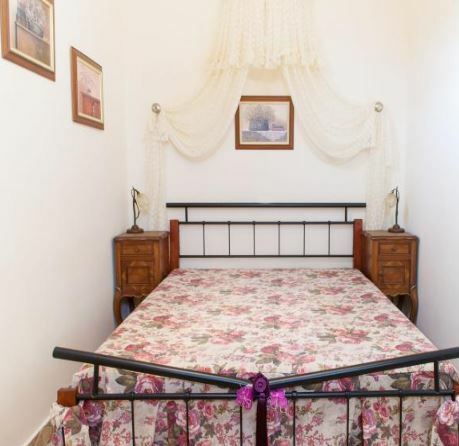 All bedrooms have wardrobes and air-conditioning. We provide you eco-friendly mattresses & upper bedclothes, as well as feathered pillows. Also, in case that you needed, there are a baby cot and an extra single folding camp bed. There are two Kitchens, full equipped with blender, electric Grill, electric Stove, refrigerator, toaster, filter coffee maker, nespesso coffee maker, boiler, dishes, cooking utensils, pantry items and other modern facilities. Also there is a dining area for 8 persons. There is a bathroom on each level (total 2 bathrooms) equipped with toilet, shower, bath towels, hypoallergenic shampoo and shower gel, hair dryer, 220V supply to shaver point and washing machine. 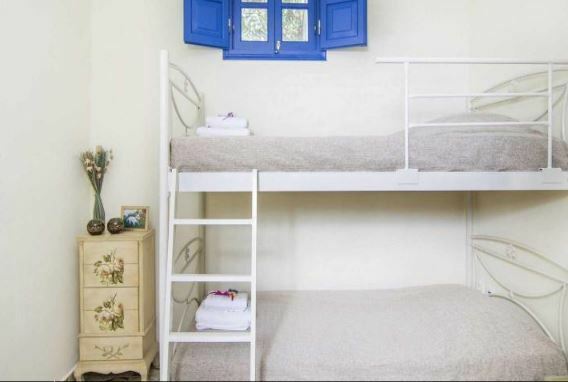 While the villa accommodates easily 8 persons, our strong preference is to limit the number to a maximum of 8, except where children are included. Amenities: Private outdoor heated hydro massage spa, swimming pools, outdoor fire pit, hob/stove, oven, fridge/freezer, washing machine, iron/ironing board, vacuum cleaner, satellite TV, DVD, private outdoor charcoal barbeque, air-conditioning system, stereo system, safety box, alarm clock, hypoallergenic soap and shampoo gel, games, books, local maps, information book, music and DVD library, mobile telephone and FREE Internet WI-FI access. In addition, we can afford you a baby cot, a baby buth tub, a baby monitor, for helping you to watch over your youngest children and a child high chair. Check in: 14:00 pm. (Flexible). 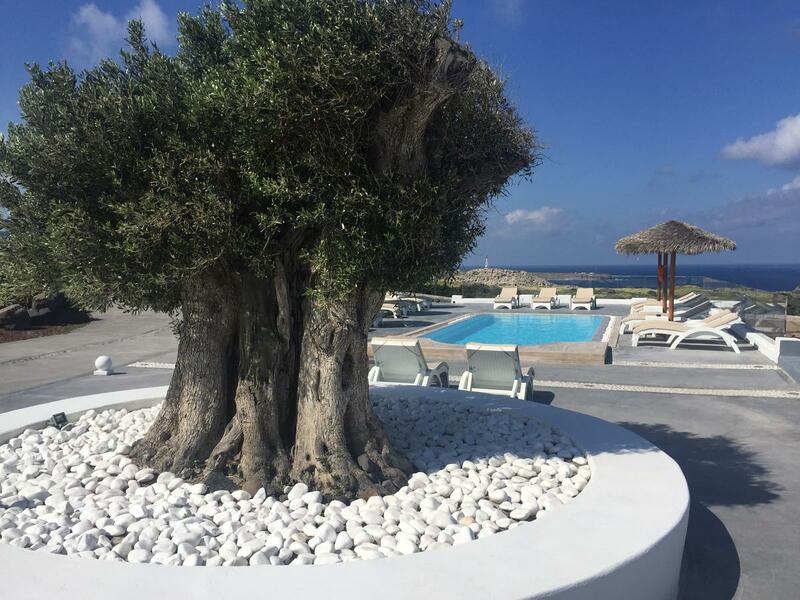 Check out: In order to prepare the villa for new arrivals you are requested to vacate the villa by 11:00 am on the day of your departure (Flexible). 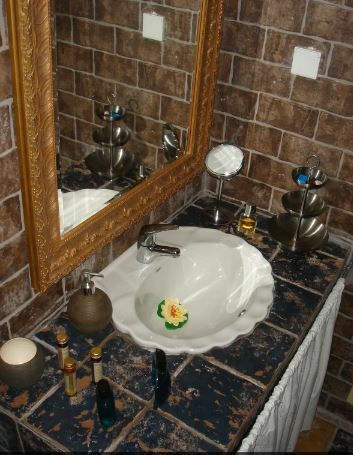 Upon arrival you will find the villa fully serviced with fresh linen & towels. 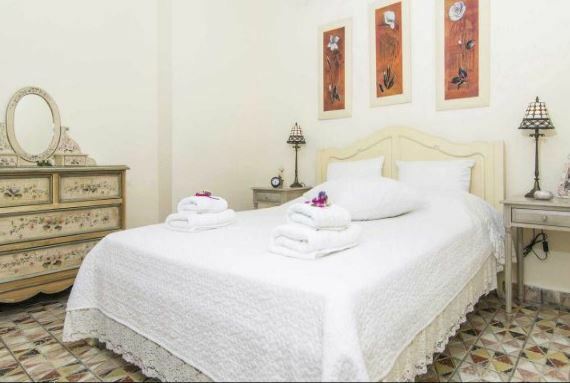 Two times per day there is maid service and every forth day sheets and towels change. In addition, every day, we can handle your grocery and bakery shopping, without any extra charge. If you are interested about transfer, car or Moto rental, helicopter tour, boat tours to the volcano and nearby islands, private tours around the island, hiking routes, walks through a vineyard and a winery, climbing, photo tours, discovering ancient Santorini, horse riding, scuba diving, sea kayaking, jet ski, parasailing, boat renting, shopping with style, romantic dinner, catering, food shopping, babysitter, massage or private chef you can ask it for and we can promptly help you to find exactly everything you need. In fact, our service is personalized. When we check you in your house, we sit with you and talk in order to help you plan your vacation, as you have imagined it. We can arrange everything for you. We are on call for anything you need and are discretely close to you during your stay! The villa is accessible by car with private parking area. You have to consider the internal stairs, which drive you to the lower floor and the loft bedroom. People with mobility problems will face difficulties. What is more, young children must be supervised at all times. Katharos beach is accessible by walking (10 minutes). The fabulous Ammoudi small harbor with fishing boats, waterfront taverns and restaurant & St.Nicolas Island is accessible by walking (10 minutes) or by car (3 minutes). Ammoudi is one of the most beautiful spots in Santorini. Get off at the foot of red rock for swimming and also to enjoy fresh fish at the taverns and restaurants. 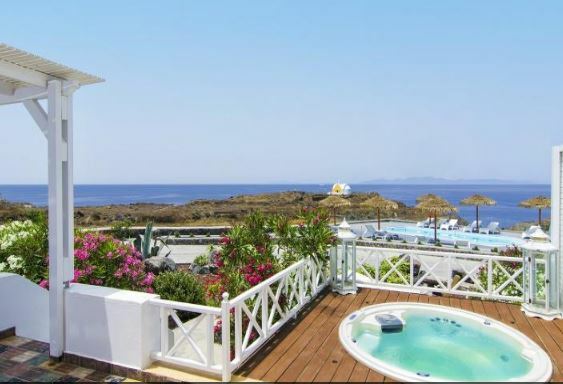 Also, the villa has two common use swimming pools, where you can swim in front of one of the best views to the Sunset! 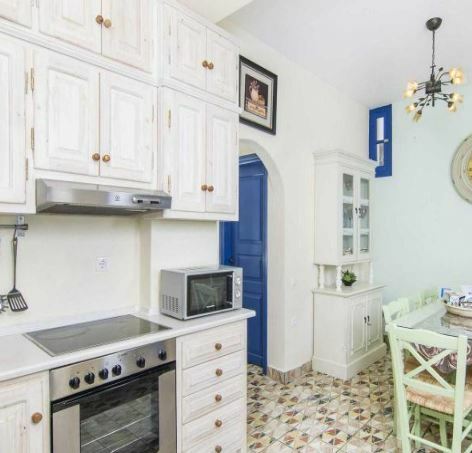 The villa is located 400 m. from Oia village, 30 minute drive from Fira town, 45 minute drive from Santorini airport (17 km) and 40 minute drive from Athinios port (15km). During your stay in Santorini it is recommended to hire a car for easy access throughout the island. Santorini can be reached by air from Athens with two flights per day or by ferry from Piraeus with frequent departures through the year. During the summer period there are additional flights between Santorini and other islands, and charter flights from abroad. 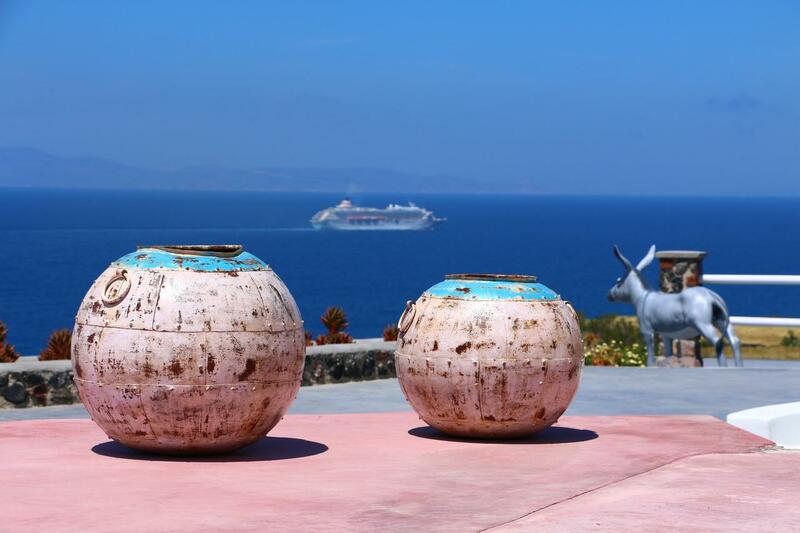 There are also nautical connections between Santorini and many other Cyclades islands, Dodecanese, Crete and Thessaloniki. Santorini can be reached from most international airports via Athens. Athens is served by the Athens International Airport Eleftherios Venizelos and from Athens you can fly to Santorini airport (Thira). 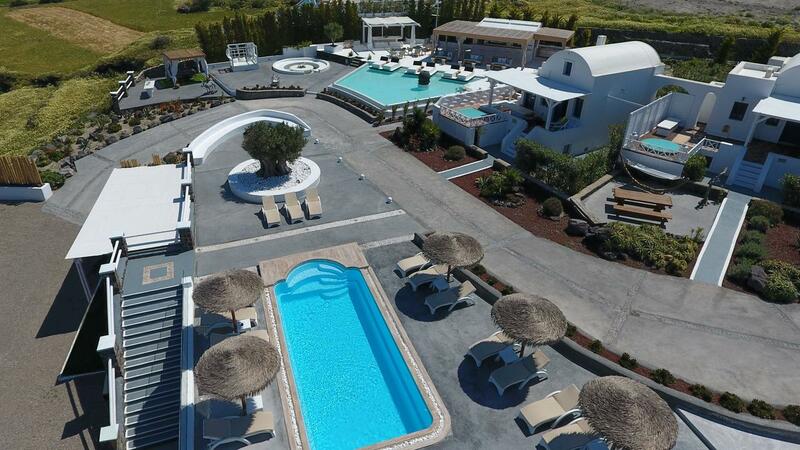 Nearly all international flights arriving in Greece allow adequate time for making the connecting flight to Santorini, but because local flights have a minimum seating capacity, please book these flights early. For those participants having extra time, there is a regular ferry boat service to Santorini from Piraeus offering a relaxing, pleasant journey. The cost is reasonable and takes an average of eight to nine hours. In addition there is also the solution of the speedy boats, which make this journey in five hours. Advanced reservations are not usually required on the ferry boats. For exact times, call Piraeus port authorities. There are 2 ways to move around Santorini, if you do not have a car or a scooter: the public bus and the taxi. There are connections for every village and on summer time there is a bus every 30 minutes, with the last one at midnight. On winter, the bus runs every 1 hour and the last one is around 9 pm. The central us station is in Fira next to the taxi station. Also keep in mind that the public transportation buses are green. Any other color you will see they are tourist buses. The buses here do not have automatic machines, so you have to have money with you to pay the collector. Maximum cost per ride is 2 euro per person, depending where you are going. The taxis are available on winter, but extremely hard to find on summer therefore we strongly recommend booking your transportation before you arrive. If you want to try your luck you can try book a taxi, if you go to the central square of Fira. Why the owner chose a home in this location? The history, originality and power of Santorini remain alive in every single bit of it: in her blue, black, white and red colors; and in the colors that you have not even seen yet. Very few islands all over the world have been loved so much as Santorini. Very few places all over the world have become synonymous with beauty and uniqueness like Santorini. Welcome to the island where feelings and senses are always at their peak –never faint, neutral or half-hearted. For it is only here where you can stand at the edge of the caldera and get rid of everything inside you that you do not need. Get ready to feel refreshes and stronger! So much has been written about the mysterious sea realm. The colorful land, the enchanting sunset and the clean blue sky of Santorini! Worlds are poor to express the grandeur of an island that knows how to get reborn out of ashes. The mystic caldera makes the island of Santorini unique. There is no doubt that the caldera is among the most highly discussed and photographed places on earth. Santorini Island has a unique morphology with Volcano Islands surrounded by great views. 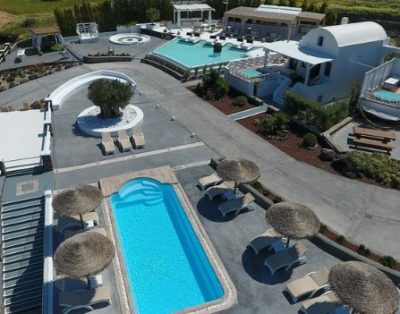 This, together with the beauty of the natural volcano, its unique historical monuments and geological characteristics, makes the island of Santorini very special and thus a popular tourist destination for thousands of visitors who come every year to enjoy this beautiful Cycladic Island. The aura of the Aegean Sea, the wild colorful rock faces and cliffs, the small picturesque houses chiseled into and on top of the cliffs, the amazing spectrum of colors reflected on the sea at sunrise and sun set, are bound to stir up your emotions giving you an experience of a life time. You can have peaceful or lively moments depending on your mood. Unfolding along volcanic rocks, the traditional village of Oia -a listed monument- is the crown jewel of Santorini. 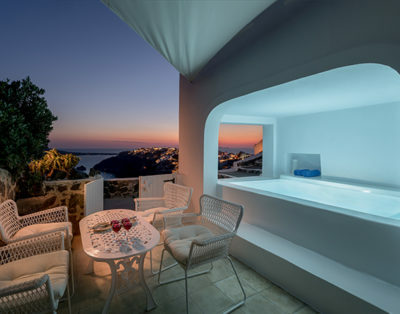 Adored by everyone for her eternal exquisite beauty and enchanting sunsets, Oia seduces visitors with her picturesque “yposkofa”, quaint alleys and imposing caldera. Oia village is the number one traditional settlement of Greece and is famous worldwide for its architecture and sunset view. Oia is one of the most beautiful villages of the island, carved out of the cliffs and clinging to the edge. The architecture is amazing and is highlighted by the stark white of the buildings and the contrasting colorful doors and window shutters. It has often been compared to the eagle’s nest! 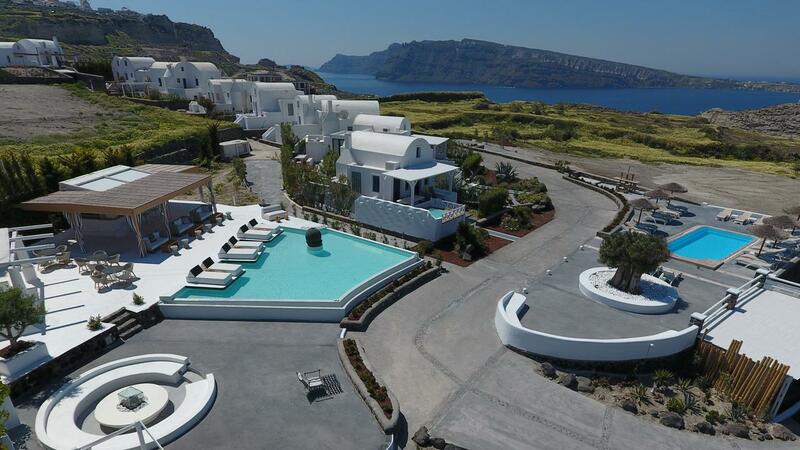 Enjoy the panoramic view of caldera, the volcano, Thirasia Island, and the rest of Santorini looking back toward Fira. 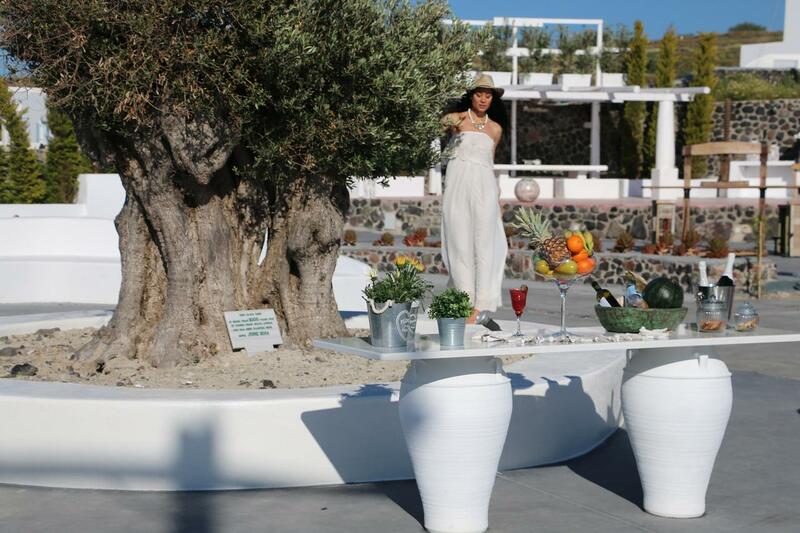 Strolling in Ammoudi, wandering around churches and neighborhoods, taste the ultimate wines of Santorini at the island’s wineries, delight in the spectacular sea view, feel the volcanic nightlife vibrations and make shopping with style. Oia is a favorite haunt of artists, many of whose works can be found in the local galleries of the village. And no wonder … who would not be inspired by this magical place! While the sun sinks into the sea, its splendid colors spread throughout the sky. It literally takes your breath away! Get a front-row seat on the terrace of villa and enjoy a drink, while watching the setting sun produce an array of colors beyond your imagination. Staying at Villa “DIAMOND” you have the privilege of privacy, a great view to Oia’s sunset, access by car and doesn’t require hard walk at steps, a private parking area, two swimming pools, a private outdoor heated hydro massage spa, a cool location, a private yard with a great view, a house built by and for the owner and not for rental. When you arrive we’ll provide you a complimentary hamper which contains: a bottle of wine, mineral water, orange juice and some original Greek products. 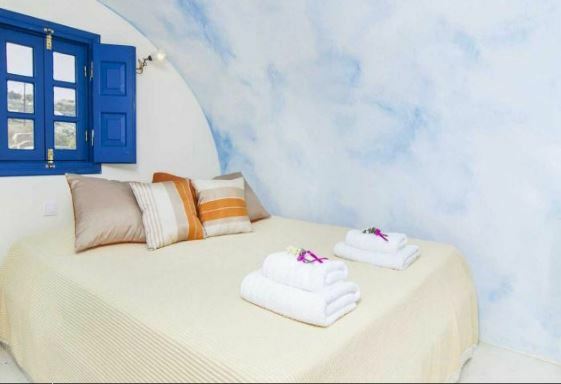 In the house you will also find a private guide with all tips for the beautiful spots of the island, which will help you to enjoy an unforgettable vacation in Santorini. 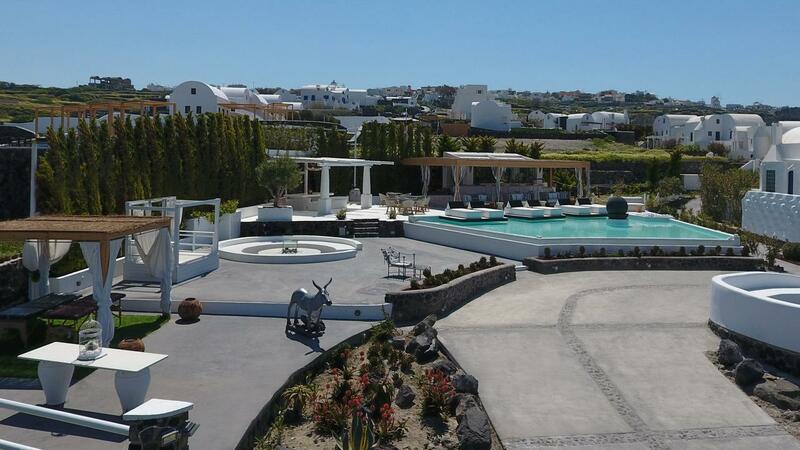 This villa will appeal to those looking for a luxury home which is among peaceful Oia surroundings. The luxury combined with the ultimate privacy offers an unforgettable stay and a unique experience. 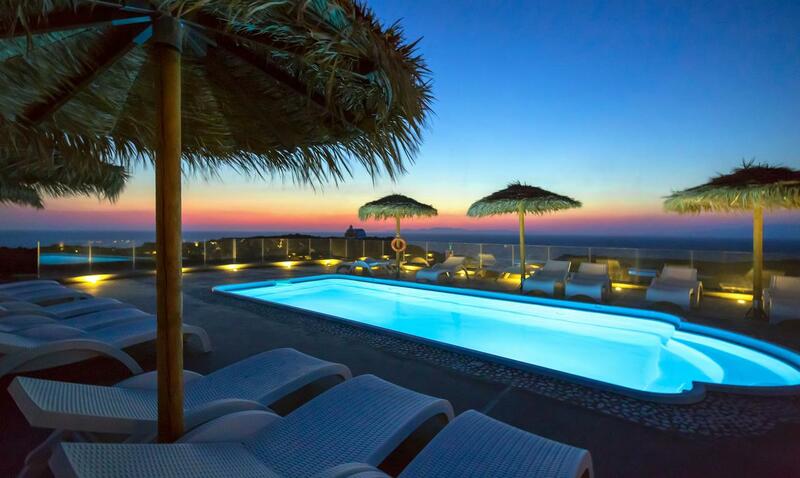 Enjoy the traditional Cycladic architecture, the simple luxury, the experience of sunset views. 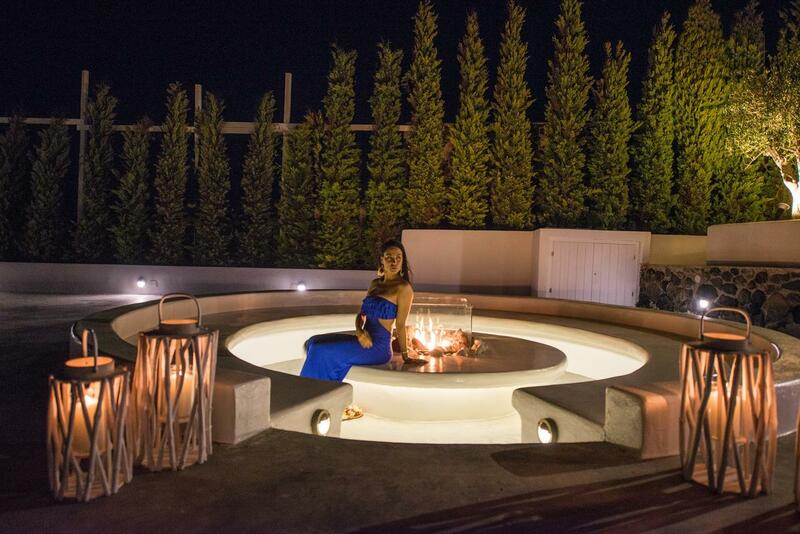 Relax body and soul in a private outdoor heated Jacuzzi hydro massage spa. 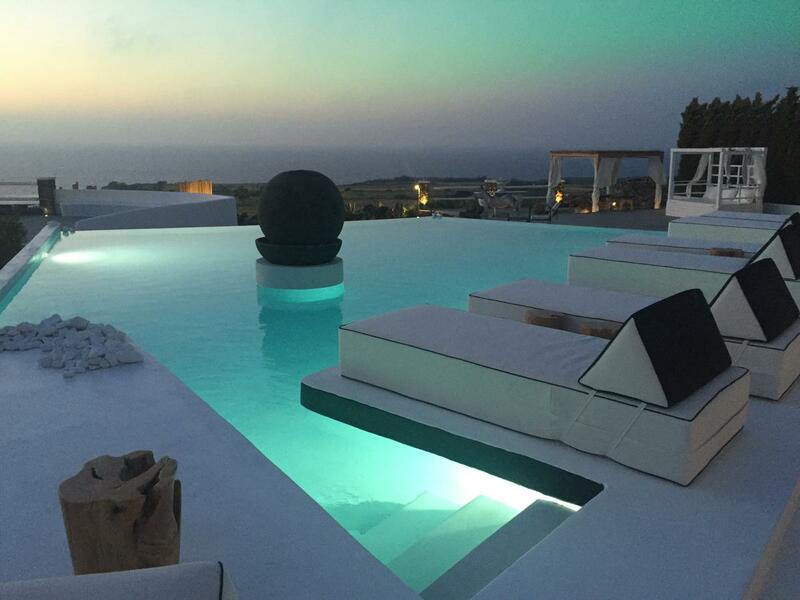 Luxuriate to the swimming pools with this splendid sunset view. Villa “DIAMOND” is specially designed for persons and families, who want to live the extra ordinary!